HELL'S KITCHEN — For years, Randy Stricklin-Witherspoon has fed the actors, designers, and stagehands of Broadway. Now his Southern country cooking is ready for the spotlight. A dresser in the costuming department at the musical "Wicked," the South Carolina native routinely brought trays of fried chicken and pork chops to the green room during matinees, he said, before launching a catering business, Spoonfed. Stricklin-Witherspoon now plans to bring his laid-back Southern style to Ninth Avenue, where he’ll serve up specialties like blueberry sauce pork chops and “Mac and A Lotta Cheese” to the public. He’s trying to get a lease at 744 Ninth Ave., by West 50th Street, and started a crowdfunding campaign to help put him over the top. The restaurant will recreate the backstage experience, “a place to go and chill and chat,” Stricklin-Witherspoon said. He plans to play old gospel and R&B, and host a Sunday buffet, which he said is a common Broadway ritual. 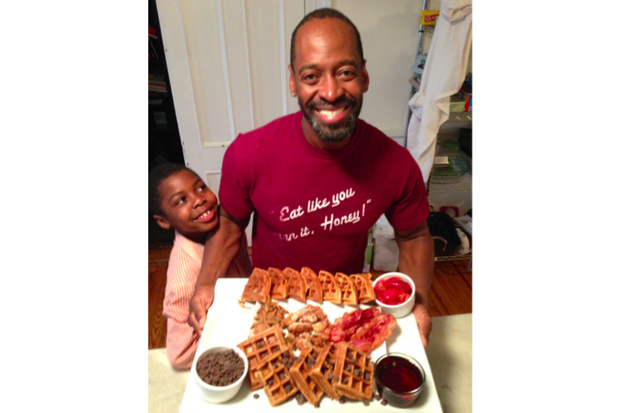 Stricklin-Witherspoon, who learned to cook from his grandmothers and now lives with his husband in Fort Greene, currently caters Sunday matinees for a rotating crew of shows. He slips in the stage door with the food and the community chips in to pay.